"I received Kodiaks urn, the packaging was excellent, and when I opened it, it brought tears to my eyes. It was absolutely beautiful. I feel so much better knowing my best friend has such a beautiful place to rest. 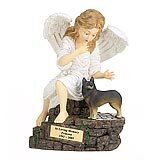 It is a piece of art that I can display and look up at, and remember my loyal friend. Thanks so much for your understanding and service." 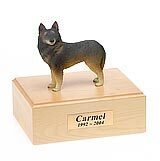 All available Belgian Tervuren dog urns and memorials will be displayed with the figurine on the Belgian Tervuren urn you select and in the appropriate size.